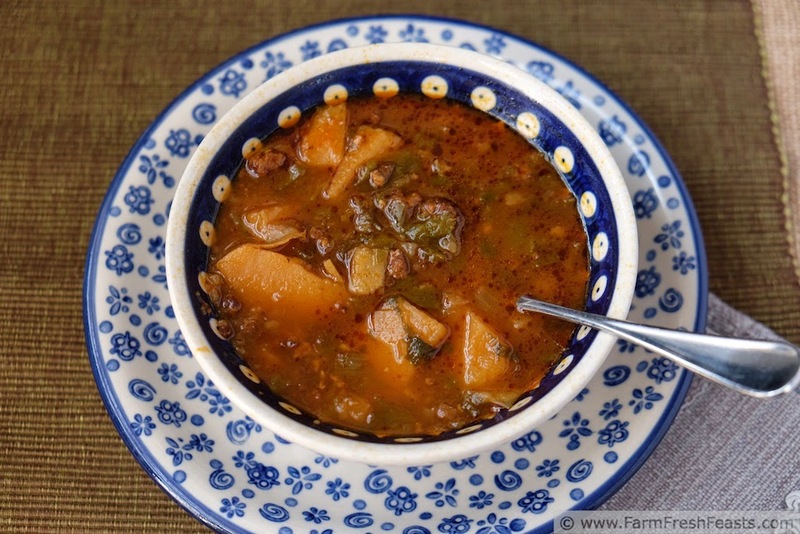 Spicy sausage, mustard greens and potato in a hearty slow cooker soup. When the community supported agriculture (CSA) farm share give you a gallon-sized bag of mustard greens, you've got to get right on them. If you don't, you'll turn around one day to find 3 gallons of mustard greens jockeying for space with the cabbages, lettuces, spinach, and . . . . the next thing you know, you have Greens Paralysis. It's a common phenomenon. When I was suffering from Greens Paralysis, as I posted on my FB page, it was primarily due to an excess of mustard greens and too few family dinners. At a recent Local Food Summit in my town I had the pleasure of listening to my farmer, George Mertz, talk about the benefits of joining a CSA. One that I wasn't expecting to hear, but absolutely agree with, is that joining a CSA will increase the number of times you'll sit down to a home-cooked meal. This easy home-cooked meal broke my Greens Paralysis. With just six ingredients it assembles quickly in the slow cooker. Now, when I say 'only six ingredients' I'm not talking about ingredients like a cake mix and a can of pie filling. It's true, two of my six ingredients are chock full of other ingredients. Those would be the chorizo and V8 juice. [Actually, so is my chicken stock, now that I think on it. But I can pronounce all of these ingredients.] 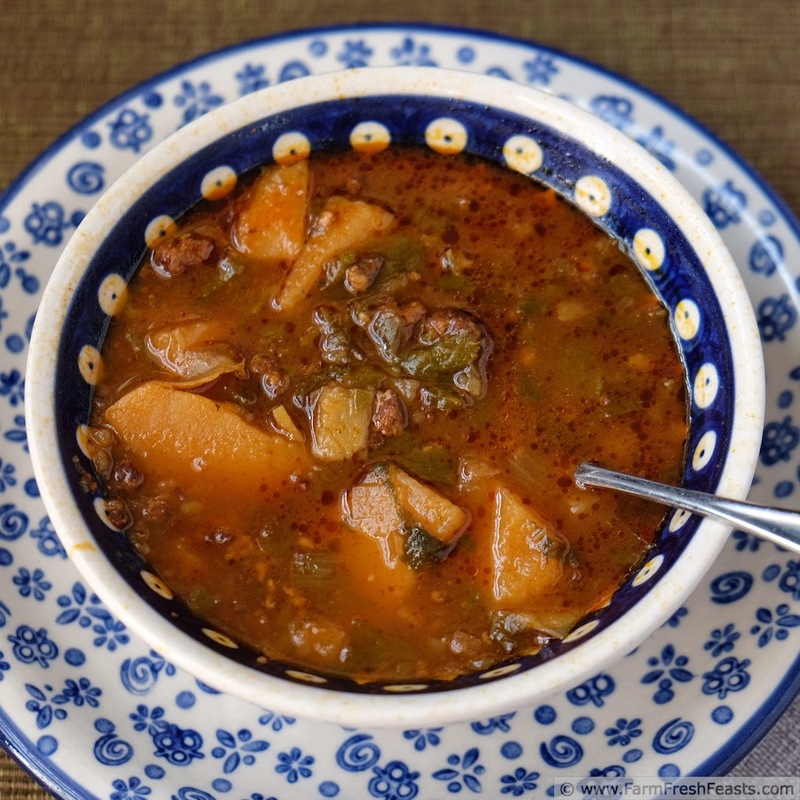 The sum of the parts of this soup, thanks to those multi-faceted ingredients, is superb. Like nearly all soups, it is better as a leftover on the second day. And anything that breaks my Greens Paralysis, that enables me to get my groove back with respect to my farm share, is very appreciated. For other recipes using mustard greens, please see my Mustard Greens Recipe Collection which I will now run off and make. Preheat a large skillet over medium heat. Add chopped chorizo and cook until browned, about 5 to 8 minutes. Transfer to slow cooker. Sauté onion in skillet (I used the fat released from the sausage) until softened, then add to slow cooker. Top with the rest of the ingredients. Cover, turn on the slow cooker, plug it in [I always forget this] and cook on High power for 6 hours until the potatoes are tender. 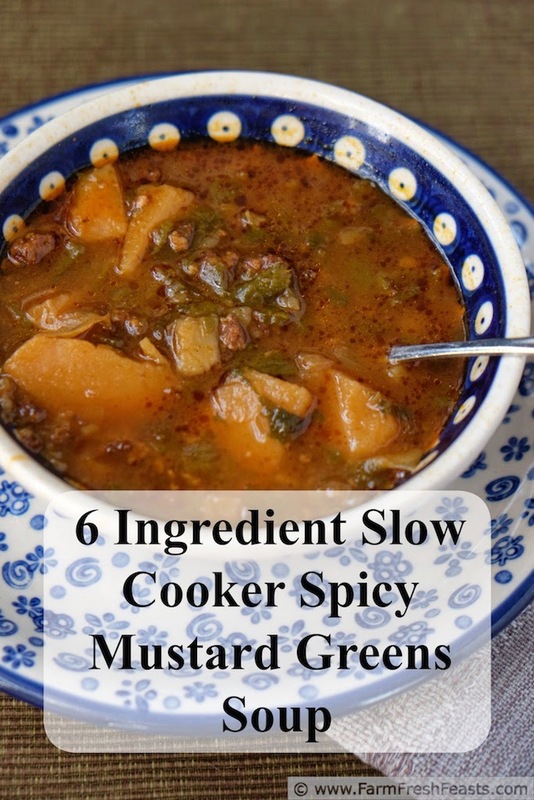 This soup can hang out on Warm or Low power for several hours--if you have a programmable slow cooker it can cook and then keep warm while you're away. Lovely! and I’m so intrigued by the idea that joining a CSA will help you cook at home more -- someone needs to do something with that! PS I’m thinking this would work with plain burger with some added spices. Thoughts? Someone ought to do something with that. I'll see what I can do over the winter, when I'm not despairing over how to use all the stuff in the fridge before it spoils! I think the only problem with using plain burger and spices is you'd need to change the name to a different number of ingredients! I sure have plenty of ground beef left in the freezer to give it a try. Hooray for breaking out of the Greens Paralysis. It ain't easy, but I knew you could do it. I feel like there's a witty quip I could say about drowning in salads and bitterness . . . perhaps something escarole-ish . . . but I'm not finding it now. I'm having success with turnips these days and feeling pretty chuffed. Thanks! Simple is good--especially as you near your due date! What a hearty and delicious soup! Thanks for linking up with What's Cookin' Wednesday! And so easy to throw together. Thanks for hosting!